First, there are two entirely separate types of museum field trips: Those created and led by teachers at museums, and those created and led by the museums themselves. Field trips led by teachers have a the potential to impact students in far greater ways than those generated by museums. This is because teacher-led field trips are an extension of the classroom, and thus demonstrate how the work of the classroom relates to the larger world. They are also led by people who know their students well. A student from Lyons Community School at the Metropolitan Museum of Art, during a teacher-designed and led field trip. But teacher-led field trips, like all lessons, have to be carefully designed to achieve their potential impact. This requires significant effort and investment on the part of the teachers. A scavenger hunt found online, or a worksheet used over and over regardless of where a specific class is in a unit, is not a carefully designed lesson. Because they take so much time and energy to prepare, effective teacher-led field trips will always be rare. The second type of field trip, one created by a museum, is ultimately about exposure: exposing children to new places, objects, subjects, and ideas. This is particularly important for the children whose worlds are most narrow: lower-income students who may rarely have the opportunity to leave their neighborhoods, who do not vacation in distant places, whose parents may never take them to a museum or a play. When children’s school day is limited to testable subjects, those subjects become abstract and dull. Museums are a vehicle for exposing children to the things that one can discover and explore through reading and math, the reasons these subjects are worth learning, the things that one can see and do and learn and become when one grows up. 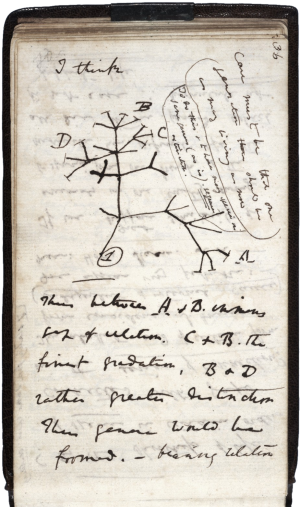 Charles Darwin’s 1837 diagram of an evolutionary tree. But exposure has become a bad word in the minds of funders and school administrators, and thus is taboo amongst museum educators. A grant proposal asking for funding for one-time visits, with the goal of exposing children to something new, would be tossed out by most funders. Museums argue that field trips cultivate critical thinking and disciplinary knowledge because without this claim, most schools will not allow a visit during the school day. There is another problem with exposure: It is not a sufficient guide in program planning. Saying that field trips expose students to new things does not help museums design excellent field trip offerings. Good program design is guided by clear ideas about why something is important, and thus what the program needs to look like to be successful. But it is possible to simultaneously understand field trips as being about exposure and set clear goals that provide guidance in program design. Another, perhaps larger, problem is that exposure is not an ending, but a beginning. Building on exposure to new things, helping students use their new-found interest or curiosity as a starting point for exploration, is the job of the teacher. Museum visits become important after students leave. Often – again, especially for lower-income students who may have limited access to books and computers in their homes, and limited access to people outside schools who can help them identify resources to answer the questions sparked by a museum visit – this requires someone at the school to help students find avenues to follow their curiosity. But in our current educational climate I do not think teachers understand this as their role in a museum field trip. Nor do they always have the freedom or time to do this follow up work back in the classroom. This is not an end to my exploration of field trips, but a mid-point that leads to new questions. How can museums effectively communicate to teachers the role they can and should play in museums visits, and the importance of this role? How do we measure the types of impact that come from exposure to new ideas and objects? How can we position museum visits as a social justice initiative, helping ensure that all students have reasons to read, not just reading instruction? ← When do we edit participation? I think it’s an important point that exposure implies passivity. Which makes it necessary but not sufficient. What does exposure achieve? Why expose kids to museums? But the problem for museum educators is that the follow up is out of our hands. How do we encourage and support teachers and parents in the follow up needed to make exposure meaningful / useful? As you know, David, I am a big fan of the Think Tank model. :) But that only works as a vehicle to engage that small group of teachers. Presumably we want more classes coming to our museums than the 10-15 whose teachers work closely with us to develop programs and ideas. How do we make that happen? – Pre and Post-visit materials that can be downloaded or emailed at the time of booking and as a follow up with a satisfaction survey. Even small activities teachers can fold into pre-existing routines (morning writing time or journaling, read-alouds, museum vocabulary for spelling lists, ways to incorporate or collaborate on projects with a content specialist) can help without demanding a lot of extra planning time from teachers that are already overworked. Prompts and activities that don’t require a lot of photocopying or supplies are important for teachers with really thin supply budgets. – Open houses (possibly after hours) with something new and fun for teachers to learn in addition to getting familiar with your museums’ offerings (meet an artist, learn a new technique, backstage tours, science activity that can be done in the classroom, etc.) (and food if you can manage it. Food helps with teachers as much as it does with teenagers) This could also be pitched at the parental audience, too. – Take home activity sheets for parents. With my favorite program at my last museum, Story Trails, I always made up a sheet of Reading-Rainbow-style “if you liked ____, here are other books and activities to read and try at home” resources, including books, family-friendly websites, and a simple art or science activity that could be done with household materials. I didn’t add a blurb for parents on the back about the importance of extending the museum experience, but one could, and perhaps should. I’m not sure exposure is passive. The very thing that is compelling about free choice learning environments like museums is that the visitor has agency to explore an open space full of objects with unlimited potential for personal and social meaning. I’ve been thinking a good deal recently about what can realistically be achieved in a field trip and a guided tour – simply letting young people know that these exploratory spaces exist in their communities and are welcoming to them is a huge learning experience. I’m becoming a fan of museum education rethinking (and renaming) itself as facilitators of learning and engagement. The learning is in the hands of the learner – they will take from a museum visit the learning of their choice. What we need to do is remove barriers and be ready to leap into their inquiry rather than setting an agenda for them. I agree with Erin’s that I am not sure exposure is looked at at passivity. I know this was more so in the past, but when I think about what Erin has brought up in terms of free-choice learning environments and the idea of learner or visitor centered experience coupled with the ever growing expectation that visits should be customizable to a visitors needs (often through new technologies) makes me think that exposure is gaining more traction as something of value. Mark and Erin – I don’t think exposure is passive for the visitor, but I do think that it can be a way for the museum to be passive, by abdicating responsibility for the visitor experience. Which is why I would claim that while the goal of field trips may be exposure, museums must keep in mind a more active goal for themselves, in order to be offering the best experiences possible. I am hoping today’s post (August 3) clarifies that! This distinction – between ‘exposure’ as a visitor’s goal vs. ‘exposure’ as a museum’s goal – is helpful. I really feel that any field trip to a museum for a child, whether passive of interactive, is very worthwhile. Most inner city children and those with parents who do not visit museums with their children will gain a huge insight into cultures restricted to them by lack of knowledge on the part of teachers and parents. It opens a whole new world they can tap into. At our museum we concentrate on artifacts that the students can actually handle as well as a tour to show them new wonders of the world they may have or never will be able to see elsewhere followed up by an art project relating to the tour. This gives the children a tangible reminder about their visit. This includes teachers as well as students.How many teachers have actually travelled to other countries or even know about othr cultures? Many teachers visiting this museum have not and their knowledge of world cultures is sadly lacking. They often do not have the time or energy to do extensive follow up lessons. We also go out to schools to take artifacts and fun projects to the classroom, but the “exposure” to a room full of interesting and often exotic aftifacts is very stimulating. Children become increasingly bored at school with their teachers and a fresh perspective on culture from a more knowledgable docent in an exciting atmosphere is a “Wow” factor. I would recommend a well informed docent leading a stimulating tour with artifacts the students can handle followed by an art project relating to the culture. Cynthia, I am intrigued by your comment that “any field trip to a museum for a child, whether passive of interactive, is very worthwhile.” I am not sure this is true. I suspect that many children have been turned off of museums because of bad experiences as school children – field trips which make them think that museums are boring places. But I think this merits more research, which I will try and find a way to do! I don’t think exposure is a bad word but perhaps needs more definition. Just as we articulate our goals with each learning experience, if we identify clear objectives for this type of visit it provides an expectation/justification for the educators as well as the potential impact on the student: Increasing awareness of opportunities available in the community, Building and practicing cultural literacy, Gaining experience with the museum (or cultural site) as a resource for further learning, etc. In terms of social justice, these are essential for developing the whole child/learner and creating more engaged, more aware global citizens. We need to consider post-tour materials will amplify the connection between these experiences and the classroom curriculum as well as every day experiences. Meg’s ideas are excellent in terms of providing support to teachers (and families) who may be first time museum-goers themselves. We should also be utilizing our long-term users as mentors (peer-leaders) to broaden our reach within the teaching community. We know that an initial visit to the museum can be overwhelming. Supporting the educators and the students by providing a framework (objectives and post-tour support) will result in more successful visits in the future. These “exposure” visits are vital.